Famous women in modern history have worn eternity rings. Eternity bands consist of a precious metal construction and accompanied by gemstones. Most women choose to wear them on the same finger as their engagement ring. There are a number of different of unique wedding ring—such as a pave setting—that will bring attention to your one-of-a-kind infinity band. Eternity rings are a timeless and popular wedding band. Guess what? They are not new. In fact, they havebeen popular for nearly two centuries. Rhinestone eternity rings were popularized in the early 18th century as a dressing for royalty. As technology developed and gemstone setting methods advanced, infinity bands continued to gain popularity. 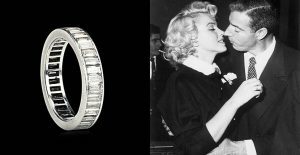 New York Yankees baseball player Joe DiMaggio famously gifted Marilyn Monroe a platinum eternity band with baguette-cut diamonds placed around the ring’s perimeter. Infinity rings symbolize never-ending love and used to be given after the marriage had taken place. Not anymore. You will get your ring on your wedding day as the more expensive engagement ring will have already been received. A common misconception about infinity rings is their price. While expensive infinity bands certainly exist, it’s very easy to find a beautiful wedding band that suits your budget. You will find exactly what you are looking for with Steadman’s. You can create a posh wedding band on a budget using pave gem setting. Pave cuts use a handful of very small diamonds to create brilliant reflections in every direction imaginable. Thanks to the small size of the diamonds used, pave rings are not only affordable, but the diamonds used are ofextremely high clarity and color. The end result? A beautiful and inexpensive ring. Pave bands may be cheap, but they’re not for commoners! Kate Middleton (yes, that one) wears an pave eternity ring on the same finger as her engagement ring. Yes! You too should wear a victorian engagement ring proudly. Once you have decided that an eternity ring is for you, a whole new world of possibilities open up. What cut of diamonds are you going to use? Which precious metal do you want to use as a base? How about the band width? Are you looking for a pipe cut ring or a comfort fit eternity ring? There are a number of metal types to consider when seeking out the perfect eternity band for your budget. Platinum – our most popular choice due to rarity and hardness. A platinum wedding band is the best option if it’s in your budget. Platinum rings will never fade or change color and are not easily scratched. White Gold – a clear winner for those on a stricter budget. White gold eternity rings are very popular and rigid. Yellow and Rose Gold – classics that can’t be bested. These yellow gold engagement rings and rose gold rings are traditional jewelry colors that have lasted for centuries. Express yourself in fun and unique ways that are not possible with lighter ring colors. Silver – an unbeatable value for those on a budget. Silver eternity rings are the top choice of many focused on price and beauty. It is important to note that silver will tarnish and require polishing every few years. Rhodium plating can be an effective way to prevent silver from needing service as frequently. Steadman’s Jewelers has been serving the Utah area since 1904. That’s over 4 generations! Avoid jewelry store markup pricing, long turnaround times, and poor fitting experiences. Get your wedding ring straight from the source! You don’t have to choose whether you want affordable pricing or a luxurious ring. 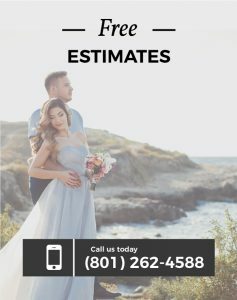 Steadman’s is the only Utah jeweler that can proudly provide you both. Our artisans have decades of experienced. They will work closely with you to ensure the end-result is exactly what you want.